Soter, a former British soldier turned private detective, is charged with investigating the sudden disappearance of wealthy recluse and obsessive book collector Lionel Maudling. Soter’s boss, the wealthy bookkeeper of the missing man in question, urges the utmost discretion in the search for Mr. Maudling’s whereabouts. Can Soter find Maudling before the trail runs cold or will an unknown presence jeopardize Soter’s already fragile state of mind? Connolly does a great job here working within the constraints of a novella. That being said, this could easily be expanded into a fully fleshed out novel. Both the characters and plot are very strong and it’s a shame that we only get to spend such a short amount of time in this world. However, I feel like that’s kind of an unfair criticism and that the book should be judged purely on what it is – a quick read that packs an emotional punch. 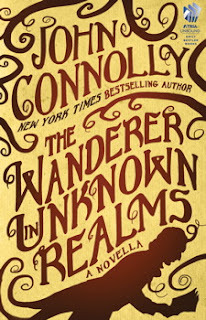 Connolly’s protagonist, Soter, is a fascinating character. Shell-shocked from his time spent fighting in the first World War, Soter has little to offer anyone other than his employer, Quayle, who uses Soter from time to time in dealing with clients who find themselves in less than desirable positions. While he’s not outwardly downtrodden, he certainly has strong opinions on those who did not serve alongside him but rather hold judgement against those who had. The hatred for ex-soldiers on the part of those who had not fought was something I could not understand. They wanted us to disappear. There were no more parades now, no more kisses on the cheek. Soldiers were no more than beggars, and nobody likes a beggar. Perhaps we made them feel guilty by our presence. They might have preferred it had we all died in the mud and been buried far from England in places whose names we had not even learned to pronounce properly before we perished. Just like in his Samuel Johnson novels, the prose differs from his trademark Charlie Parker series but still retains that trademark wit and supernatural style. While it does come across as something fresh and outside his comfort zone, it still reads like a Connolly novel. There are also a few illustrations injected between select chapters from artist Emily Hall, giving it that extra bit of creepiness. I can see a lot of people having issues with the ending but I loved it. I’m not going to tread into spoiler territory here but let’s just say that Connolly leaves it very open ended.